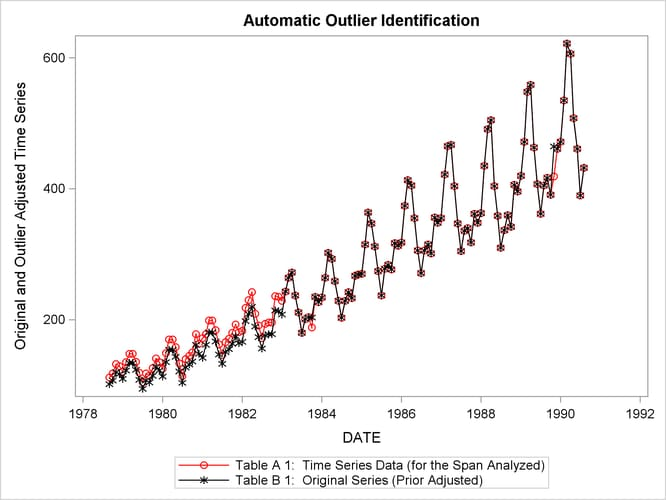 This example demonstrates the use of the OUTLIER statement to automatically detect and remove outliers from a time series to be seasonally adjusted. The data set is the same as in the section Basic Seasonal Adjustment and the previous examples. Adding the OUTLIER statement to Example 37.3 requests that outliers be detected by using the default critical value as described in the section OUTLIER Statement. The tables associated with outlier detection for this example are shown in Output 37.5.1. The first table shows the critical values; the second table shows that a single potential outlier was identified; the third table shows the estimates for the ARMA parameters. Since no outliers are included in the regression model, the "Regression Model Parameter Estimates" table is not displayed. Because only a potential outlier was identified, and not an actual outlier, in this case the A1 series and the B1 series are identical. Note: The following time series values might later be identified as outliers when data are added or revised. They were not identified as outliers in this run either because their test t-statistics were slightly below the critical value or because they were eliminated during the backward deletion step of the identification procedure, when a non-robust t-statistic is used. In the next example, reducing the critical value to 3.3 causes the outlier identification routine to more aggressively identify outliers as shown in Output 37.5.2. The first table shows the critical values. The second table shows that three additive outliers and a level-shift have been included in the regression model. The third table shows how the inclusion of outliers in the model affects the ARMA parameters. The seasonal factors are stored in the variable sales_D10. From the two previous examples, you can examine how outlier detection affects the seasonally adjusted series. Output 37.5.4 shows a plot of A1 versus B1 in the series where outliers are detected. B1 has been adjusted for the additive outliers and the level-shift. 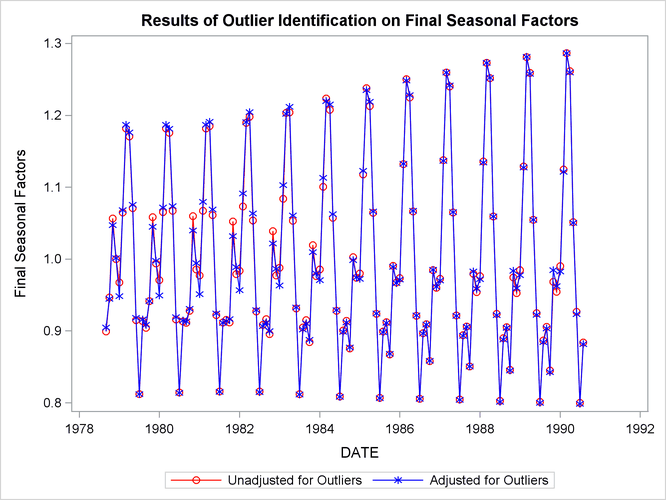 Output 37.5.5 compares the seasonal factors (table D10) of the series unadjusted for outliers to the series adjusted for outliers. The seasonal factors are based on the B1 series.